An outstanding guitar, whatever your style. Beautiful build; body and neck choices to suit; coil-split tones. It may not be a name you recognise on the headstock, but learn it well because Sabre is here to stay. 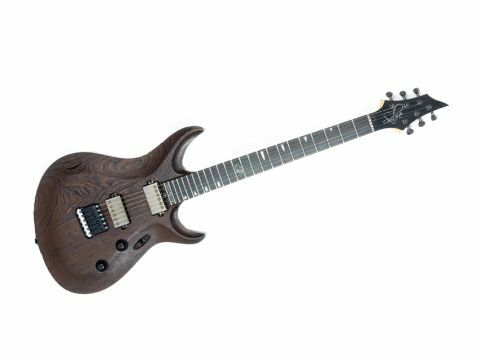 The Wraith is the entry point of the Sabre line and while the four-figure price tag places it firmly in the realm of the gigging pro, it's actually very reasonable for a British-built axe. "Dialling in sinful amounts of distortion is where this guitar really starts to sing, with the clarity and crunch of the bridge pickup providing excellent note separation and definition." From the first second we pop open the luxurious suede-covered hard case, it's difficult not to be bowled over by the sheer design prowess carved into the Wraith's every curve and angle. Compared to the spikier and more ESP-like appearance of Sabre's original Seraph model, the Wraith's gorgeous wenge body is much curvier, combining the slender lines of a Jackson with PRS-style finesse. Flip the guitar over and you'll find equally dramatic contouring on the back of the body, providing not just comfort but also the odd practicality such as the jack socket carve, which points your cable upwards at just the right angle to loop back through your strap. Handy! The rock maple neck has been paid equal attention, with a skinny D-profile that almost disappears under your hand completely and a bolt-on construction designed for optimum reliability along with increased tone and sustain. The choice of wenge for the body material is intended to bring out the raw tone of the Sabre-designed pickups, rather than add its own particular voice. The high-output bridge humbucker, then, is wound to give your amp a serious kick, whereas the neck pickup is more geared to a vintage response, with a modified Schaller switching system providing a set of coil-split tones on positions two and four. This proves to be a real asset when you start off at the cleaner end of the spectrum, with deep, crystal-clear tones. The in-between positions sound very impressive, too, and are strong enough carry over their distinctive character when you start piling on the dirt. As expected, dialling in sinful amounts of distortion is where this guitar really starts to sing, with the clarity and crunch of the bridge pickup providing excellent note separation and definition. The neck pickup is no slouch either, gleefully supplying smooth, sustaining warmth and a surprising amount of soul when the gain is backed off. It's definitely a modern sound set but the versatility is most certainly there. It can be a bit tricky to review luthier-built instruments, largely because many of the potential pitfalls are usually down to personal preference and easily offset by custom options. Don't like the skinny neck? Swap it for a full C-profile. Perhaps you'd prefer a more vocal, livelier tonewood than wenge? Then by all means opt for a korina body instead, also available for no extra charge. So essentially, what we need to do here is shine a light through the fog and decide whether Sabre has what it takes to compete with the big boys in the market. Thanks to the ingenious design and detailed tones of the Wraith, the answer to that question can only be a resounding 'yes'.